Singer, songwriter Dwele who is probably best known for not only singing on (1 of my favorite songs) Tainted by Slum Village, Flashing Lights by Kanye West, Power by Kanye, or of course his own songs such as I Think I Love U, Open Your Eyes, Find A Way, I'm Cheatin', Hold On, and the list goes on. 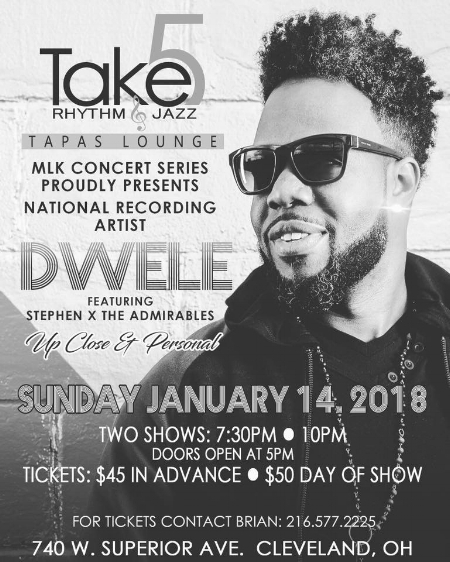 The Detroit singer is coming to The Land and blessing the stage at Take 5 Rhythm & Jazz on Sunday, January 14th with not 1 show, but 2 shows that night. Check out the information in the flyer and contact Brian for tickets to see Dwele! Newer Post[Akron, OH] Eric Benét performing live at Tangier Event & Entertainment Ctr.